We were formed in 2011, under the baton of Dr. Michael Palumbo (professor emeritus, Weber State University). We are made up of professional, semi-professional, and amateur musicians from along the Wasatch Front and are honored to call Peery’s Egyptian Theater our home. 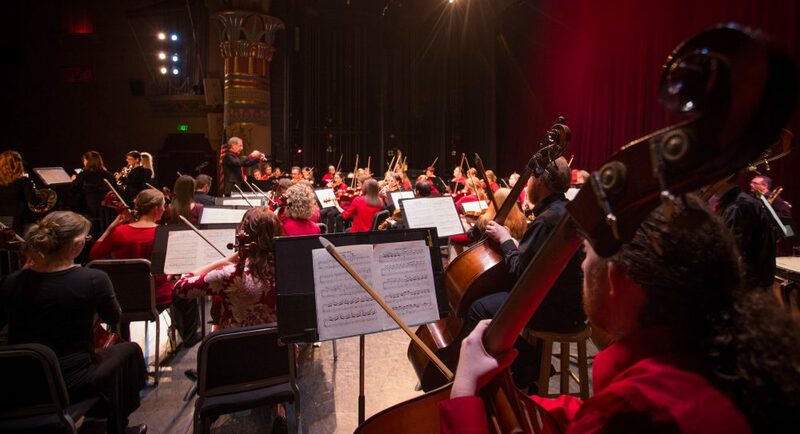 We endeavor to provide high quality, low cost professional-level orchestra concerts to downtown Ogden. We want to make classical music accessible, affordable, and enjoyable for the greater Ogden community. And I’m privileged to have an orchestra of great players and great people. Is there a particular time set up for tryouts, or any information for becoming a part of the orchestra if one is interested? I ask because I am a violinist, and would love to brush up my skills and get back into group performances like this. Thank you. Contact Mike Palumbo at 801-624-9232. I have just recently moved here from VT where I was in the AMO of Burlington, VT. I am lookingfor a group to continue with. Do you need any F Horn or Trumpet players? Please let me know. Enjoyed your concert in Ogden this evening! How much are tickets for the fund raiser for Becca?